Spain's capital city, Madrid belongs in any discussion of European travel. Madrid is filled with culture, history, and tradition. Spain's capital is a modern city in many ways, yet retains the charm of eras past. Whether you sip a glass of sherry at a corner café or admire the dark, troubled paintings of El Greco at the Prado Museum, the city has something for every taste. The Prado is one of Europe's most impressive museums. Opened to the public in 1819, the museum is built around the former royal Hapsburg art collection. This comprehensive, permanent exhibit contains over 5,000 paintings, including works by El Greco, Goya and Velazquez, as well as a sizeable exhibit of Flemish art, containing works by Rubens, Van Dyck, and Durer. 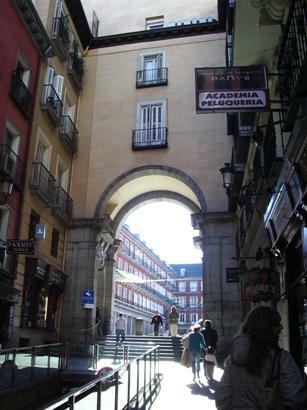 The Plaza Mayor is Madrid's geographic and cultural center, and no one visiting Spain should miss it. Built in the 17th century during the reign of Phillip III, this large cobblestone square has been important commercially and culturally for centuries. It has seen royal coronations, bullfights and canonizations, as well as the terrible executions and public burnings of heretics during the Spanish Inquisition.Today, this charming square is lined with sidewalk cafes and is an excellent spot to sip a cup of coffee and watch the crowd stroll by. In December, the square transforms itself into a Christmas fair, with dozens of arts and crafts vendors arranged in brightly-lit rows, selling nativity sets, ornaments, wrapping paper, and other holiday decorations. Madrid's massive Spanish Royal Palace was commissioned by King Philip V in 1725 after the original Hapsburg palace burnt to the ground on Christmas 1724. The palace is built entirely of stone - white Colmenar stone and granite from Sierra de Guadarrama. The seemingly endless rooms (2000 total) are arranged on four floors and surround a central courtyard. The palace is filled with important artwork, tapestries, and furniture from all periods of Spain's rich history, including works by Goya, Bosch, and Velazquez. Of particular note are the extensive tapestry collection, the Stradivarius collection (the world's largest), the royal apartments, and the royal library, which contains over 300,000 books.Today, the Spanish royal family lives in a smaller estate just outside of Madrid and only uses the Palacio Real for important state occasions. Retiro Park is a 350-acre, green oasis in the middle of bustling Madrid. Built by King Philip IV in 1632, this park was originally reserved for royal use only. Retiro Park was opened to the public in the early 19th century and is noted for its many fountains and monuments, including the ornate statue of King Alfonso XIII. A serene pond sparkles in the center of the park, surrounded by a number of small cafes. Retiro Park is also home to the Victorian, greenhouse-like, Crystal Palace, a 19th century exhibition hall, surrounded by an extensive rose garden. Today, visitors can enjoy a summer evening concert or just stroll amidst the lovely grounds. If you travel to Spain, then you must see Toledo, the ancient outpost of the Roman Empire and former Spanish capital. Just an hour's drive from Madrid, Toledo is centuries away with its massive stone facades, ornate cathedral, and narrow streets. Toledo was a major cultural center in the 13th and 14th centuries and was also the home of the painter, El Greco prior to his death. Many of his works, including the important, Burial of the Count of Orgasz, are displayed in the city. Another stunning feature is Toledo's cathedral, which towers over the town. Its delicate, stained glass windows sparkle in the sunlight and the ornate, multi-story altar, designed by Naciso Tomei, is awe-inspiring. Ignore the ever-present tour busses that line the town square and explore the maze of narrow streets that criss-cross the old town. This fascinating area resembles a North African bazaar, a legacy of the Moorish influence here. Madrid and Beyond caters to groups both large and small and offers personalized touring experiences. Whether you want a tour guide to help you and your spouse explore Madrid's museums for a day or someone to take a large group on a trip through Madrid and other Spanish hot spots, the company is more than willing to design a personalized expedition. Simply share your interests - from history to cooking to sports - and a tour guide will build an itinerary just for you. Alternatively, you can select a pre-planned package trip. Prices vary depending on the length and distance of your trip, which attractions you want to see and the size of your group. Go Spain Tours offers a variety of experiences in Madrid and surrounding areas. Opt for single-day guided tours of Madrid's biggest attractions, or hop on a multiple-day guided bus tour that takes your through Madrid and around to other Spanish cities and sites, including Andalusia, Toledo and the Costa del Sol. Special interest tours, including culinary and wine tours, are also available. Prices depend on specific itineraries. Multi-day tours include accommodation and include plenty of free time for you to explore your destinations on your own. If you prefer that a pro plan your entire trip, from your departure flight to your journey home, then Millennium Tours could be the group for you. The company runs 15-day Spanish tours that include several days exploring Madrid. Everything is included in the tour, from air travel to hotels and most meals. Ample free time is also included, so you can branch off from the group and indulge your own interests. A U.S. travel guide will accompany you throughout the journey, while various Spanish guides will meet you throughout your vacation. All tours depart from Dallas. Prices vary. SpainFred isn't your grandfather's guided tour group. These tour guides specialize in creating unique Madrid experiences for people interested in putting their finger on the heartbeat of the city's culture. The guides will tailor your tour to your interests or you can opt to take pre-planned tours based on a number of special interests, from bourbon to the city's gay community. Opt for a brief tour or let the guides show you the entire region on longer journeys. No group is too small for SpainFred. You can choose to take your own private tour or work with the company to develop an itinerary for a large group. Prices vary. Tours of Spain offers a large number of guided Spanish tour options. Select a tour that focuses on the Madrid region or opt for a longer tour that travels across the country. Guided tours feature a group option, which you are shown around your destinations by knowledgeable local guides, and an independent portion, where you are able to see the sites on your own. Travel and accommodation are included in all packages. Unlike many other tour companies, Tours of Spain allows you to pick from three different price levels, so you can stick within your budget. Make sure to include Madrid when you plan your European vacation. Spain's rich culture, history, and interesting sights are waiting to be explored, and with a little research, you can map out exactly what you want to see and do when traveling to this amazing destination.